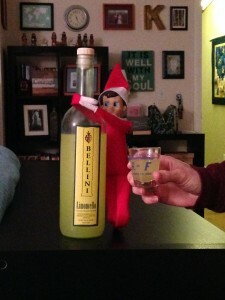 I have my own elf on the shelf tradition. Set up the most ridiculous scenarios ever to entertain your roommates. 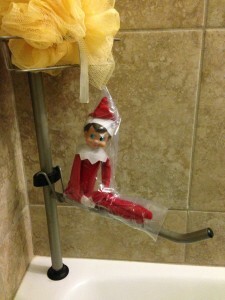 I got to introduce my new roomies to this small joy of Christmas… and they totally took to it! 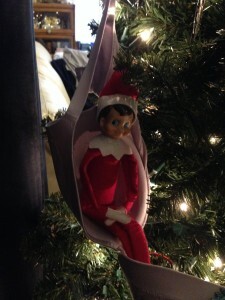 Cheeky, the apt name of my elf on a shelf, continues his yearly antics this year, succeeded in making us laugh, and in retaining a bit of the childhood playfulness that I hope I never lose. I enjoy the balance of playfulness, seriousness, studiousness, and laughter that permeates my life and I am thankful that other people in my world can help me with this balance. I declared this Christmas the Guilt-Free Christmas! Between work projects and school and other duties in life, I didn’t have time to bake or shop or craft or do many of the things I typically enjoy. Yes, all my presents were purchased online. No, I did not contribute to the cookie exchange. Yes, I ate Christmas cookies without tracking them. No, I didn’t feel guilty! I enjoyed it all. Christmas is busy and stressful and I will continue to use Cheeky as a small stress relief to my household to bring merriment and joy! May he make you smile today.